White House Photographs. 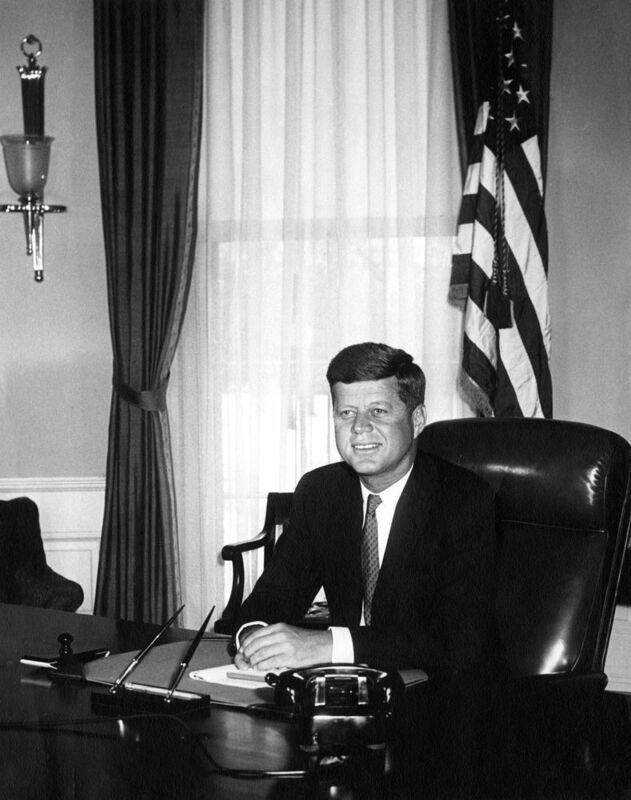 John F. Kennedy Presidential Library and Museum, Boston Digital Identifier: JFKWHP-AR6283-A. In 1960, at the age of 43, John F. Kennedy became the youngest elected President in U.S. history, during a period of growing tensions in the U.S.-Soviet Cold War rivalry. Soon after taking office in 1961, he authorized the “Bay of Pigs” invasion led by the CIA and exiles from Cuba, whose government had been overthrown by communist rebels in 1959. This failed to overthrow leader Fidel Castro, and was a major embarrassment to Kennedy. Tensions with the Soviet Union further escalated during the 1961 Berlin Crisis. These events set the stage for the Cuban Missile Crisis. On October 15, 1962 Kennedy was informed of the discovery of Soviet missiles in Cuba and called a meeting of a small circle of trusted advisors (known as the Executive Committee of the National Security Council, or ExComm). He resisted pressure to react quickly with a surprise air strike, and took time to deliberate in secret on the possible courses of action. On October 22 the President announced a naval blockade on further arms shipments to Cuba. He then worked out an agreement with the Soviets, which involved a U.S. pledge not to invade Cuba if the Soviet Union withdrew its missiles, a threat to attack within 24 hours if the offer wasn’t accepted, and a secret promise to withdraw U.S. missiles from Turkey in four-five months. Credit: Heinz Junge, Bundesarchiv. German Federal Archive. Accession number Bild 183-B0628-0015-035. Khrushchev became First Secretary of the Communist Party of the Soviet Union in 1953 after a power struggle following Stalin’s death, and served as Premier from 1958 to 1964. Khrushchev began efforts to “de-Stalinize” Soviet society. However, in 1961 tensions between the superpowers escalated over the Berlin Crisis. 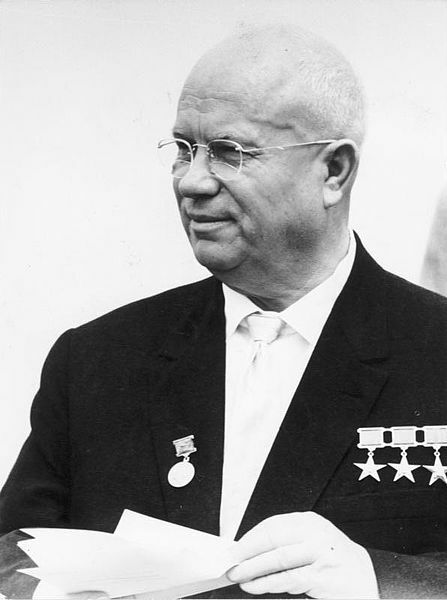 In the spring of 1962 Khrushchev made the decision to place Soviet missiles in Cuba secretly in order to give a quick boost to Soviet missile power, and to strengthen the USSR’s bargaining position regarding the Berlin question. After the missiles were discovered, Khrushchev initially maintained a hard line, expecting Kennedy to back down. However, as the President stood firm, Khrushchev reassessed the situation. Faced with the very real possibility of nuclear war, Khrushchev decided that “to save the world, we must retreat”. He agreed to withdraw the Soviet missiles, in exchange for a U.S. pledge not to invade Cuba and the President’s secret assurance that the U.S. would withdraw its Jupiter missiles from Turkey. As this American concession was not revealed publicly, the settlement was viewed by many as unfavorable to the USSR and hurt Khrushchev politically, contributing to his ouster from power in 1964.
Credit: Warren K. Leffler. Library of Congress Prints and Photographs Division. In January 1959 Fidel Castro’s revolutionary forces seized power. While the Cuban leader initially claimed this was not a communist revolution, a year later Cuba formally aligned itself with the Soviet Union. 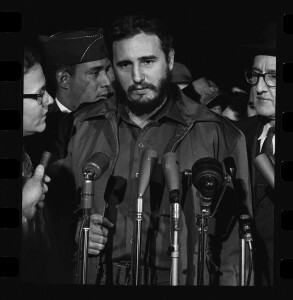 Relations with the United States deteriorated further in 1961when the U.S. supported CIA-trained anti-Castro exiles in the Bay of Pigs invasion – a failed attempt to overthrow Castro and a major blow for President Kennedy. In this context, in the summer of 1962 Castro accepted the Soviet offer to install missiles in Cuba as a deterrent to a U.S. invasion. During the crisis Castro urged Khrushchev to defend Cuba and reject American demands to withdraw the missiles. On October 27, believing a U.S. attack was imminent, Castro urged Khrushchev to initiate a nuclear first strike. Castro was excluded from the negotiations and felt that, by agreeing to withdraw the missiles, the Soviets had betrayed Cuba.